Always be careful when driving around where children play, for example playgrounds and sports fields, and around schools between 8-9am and 3-4pm on week days outside school holidays. When passing a line of parked cars look for signs of children playing. Give yourself as much of a buffer as possible by travelling closer to the centre line, unless there are large vehicles coming the other way. This will give you slightly better visibility between the cars and gives anyone stepping out from between them better visibility of you. 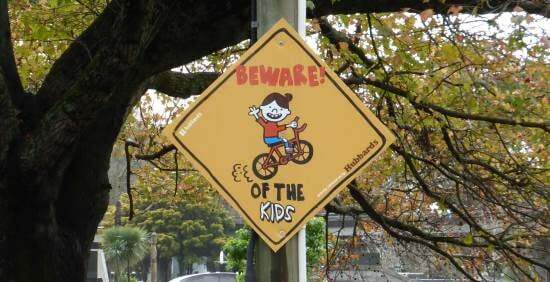 In areas where children play regularly, plus around schools, playcentres and sports facilities, you might see this sign in yellow or fluoro green. Smaller children can't judge distances and speeds and don't understand the implications of stepping out into the road. Older children can be distracted by their friends. Teenagers could be looking at a cellphone and be distracted from the road.